You might have guessed it wouldn't be long before a mad Mullah somewhere in the world popped up to hurl curses at the UK. The astonishment would be if one of Allah's wicket-keepers came out to say "Actually, England's not that bad. Harrods is fantastic; we picked up a gold-plated bidet for the tent last year. And Madame Tussaud's have got a great one of old Khomenei ..." but no. Predictably we're the Great Satan and the life-long enemy of whatever bunch of nutters aren't currently in need of foreign aid, earthquake relief, arms or a visit from Gordon Brown. Somewhere in the hills beneath Qom a bunch of Iranian Revolutionary Scientists will be flibbering away trying to work out how to get a rocket to hit Skegness whilst the mad Mullah's spies search cars for James Blunt mp3s. There's probably a white cat involved somewhere. This is exactly the time, of course, to dispatch young Miliband on a Regional Tour. It's what foreign secretaries are for. Except of course Labour ministers aren't exactly welcome in Baghdad. Or Ankara. Or Dubai, since Gordon messed up the global banking system. Still, I expect the Kuwaitis will welcome him. Such is the lot of the world's oldest parliamentary democracy. Mad mahdis, mad mullahs and insane imams have all hurled their abuse at us over the centuries. We're used to it by now. Nothing to get excited about. I'm grateful to Gordon Brown for pointing out that the abortion of redacted expenses information was part of the old system, which was nothing to do with him, oh no, it was all a complete surprise, and it was a big boy that scribbled all over his own receipts with a black marker and ran away, and that he was personally reforming the Commons by bringing in a brand new system with total transparency. It's just a shame this is all nothing more than just another autistic Brown lie. It is scarcely credible that Brown, through the Leader of the House, has not been orchestrating the rear guard battle against disclosure; the discredited and dismissed Speaker's risible legal battles, time given and support given to Maclean's shabby little bill, the grudging and petulant compliance with an order of the High Court for disclosure, the obstructive redaction of the mass of useful information all bear the stamp of Gordon's clumsy and ragged-ended fist. "The redacted expenses were part of the old system. That cannot be the new system. The old system is being swept aside by the changes that we are making. A new, far more transparent system is being introduced. While ensuring that security issues are addressed, as they have to be, our first concern must be maximum transparency." Brown's detachment from reality is now complete. It is entirely proper and within Green Book guidelines for an MP to rent office and surgery space from a local constituency party. It is quite proper for an MP to pay reasonable costs to other organisations that host their surgeries. What is not allowed under the guidance is for an MP to use public funds to pay for a local constituency party's accommodation and other costs - including photocopying, phone costs, premises costs, legal costs and cleaning costs. Lewisham East Labour Party has no contact address other than the premises claimed for by Ms Prentice. There is no evidence in the published expenses claims that these were shared or reduced to reflect a splitting of costs between Ms Prentice and the Lewisham East Labour Party. Lewisham East Labour Party claims an exemption from filing Accounting Unit accounts with the Electoral Commission on the basis that its turnover is under £50k. Under these circumstances, I shall be submitting a request for an investigation into Ms Prentice's expenses to the Parliamentary Commissioner for Standards. Bridget has already announced her plans to stand down at the next election. Although holding a polar world view to hers, and once irritated beyond measure by a clumsy response from her office to a letter, the truth is that she has served her constituents no worse than most MPs and a lot better than some. There is absolutely no suggestion in her expenses of personal troughing - none whatsoever. At the next election I shall be voting in a new constituency as the result of boundary changes - so perhaps I should be looking at Joan Ruddock's claims. If Bridget reads this, I would like to assure her I have no personal animosity towards her, but rather a sort of regret. I had perversely hoped that Bridget would be cast-iron on the expenses front. I have just seen this blog. You are absolutely correct. The grammar and flowery language were appalling. How it got past me, I don't know especially as I'm usually a bore about the aberrant apostrophe, the split infinitive etc.I probably should have written 'Eats ,Shoots and Leaves'. And any mistakes in this are entirely my own - I have never come to terms with the style of emails and blogs . They always seem so abrupt! The Incidental Expenses Provision (IEP) is available to meet costs incurred on Members’ Parliamentary duties. It cannot be used to meet personal costs, or the costs of party political activities or campaigning. You must ensure that arrangements for your office and surgery premises are above reproach and that there can be no grounds for a suggestion of misuse of public money.You must avoid any arrangement which may give rise to an accusation that you - or someone close to you - is obtaining an element of profit from public funds; or that public money is being diverted for the benefit of a political organisation. The sign advertises the Lewisham East Labour Party, with a party symbol and party contact number. Beneath it are Ms Prentice's details. I estimate the MP's portion of the sign to be about 30% and the Labour party's portion 70%. She's redacted the address at which the sign was installed and listed the claim as 'BHSC Blinds' when the Beckenham company is actually termed 'BHSC Signs and Blinds' - evidence of doubt on her part? - but I am confident that if Mr Barry Holmes were pressed he would confirm the installation of this sign at 13 Leegate. Now I reckon we are due back about £635 from Lewisham East Labour Party. What do you think? She also claims the whole of the rent, rates, services and insurance on the premises from her IEP, as well as legal fees. 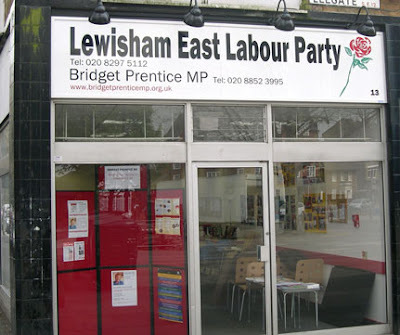 If there is evidence that these premises are partly occupied and used by the local Labour party for party political purposes, rather than solely by Ms Prentice for her surgeries and as a constituency office in furtherance of her work as an MP, there may be a further case for reclaiming even more public money. The socialist vision of an all-powerful central State making decisions about the lives of its citizens 'for their own good', rationing their wealth and regulating their advantages to achieve a dreary mediocrity in the name of a spurious notion of equality has no place for an independent Legislature. The job of Parliament under the socialists is to do what the State decrees. The first step towards this is to tear the gonads from the bodies of our MPs. I have long railed against the idea of 'professional' politicians, cuckoos who foul our democratic nest. From acne-scarred sixth form debater to Uni Ents officer to political researcher to MP, all without having done a single useful stroke of work in their lives. They are anathema. Yet they are exactly the noisome amoeba with which Gordon Brown would fill our Parliament. Benedict Brogan terms them 'call centre workers' in this morning's Telegraph; I can think of more robust descriptions. Brown's autistic policy furrow will brook no reasoned debate, no concession to the common interest; it is a destructive and malign line direct to the perdition of a Statist socialist 'democracy'. However, I am confident that he will fail. An MP practising as a solicitor brings to the House the hell of the Uxbridge Magistrate's Court and the failure of the Justice department; a practising barrister likewise a useful perspective from the higher courts. A consultant who finishes his list by lunchtime and spends the afternoon and evening in the House brings the reality of the NHS to the bars and tearooms as well as to the chamber. A joiner, a surveyor, a smith, a journalist even all bring cogent and current perspectives to the business of the Commons, and those who run businesses and enterprises are a standing reminder to the House of the wealth-generation that underpins the very fabric of our nation. Yet Brown would clear them all from the House, to replace them with insipid, obtuse, inexperienced polidreks responsive only to the whistle of the Party. He would abolish the Citizen MP in favour of the obedient apparatchik. But I am confident that he will fail. For as long as there remain in our cities and shires man and women of independent mein who are prepared at risk to their own well being, at risk to their privacy, and with the support of their families and communities, to stand for Parliament, Brown will fail. Becoming an MP should not be easy, and should not be without sacrifice. If it were so, we would attract the basest and most pliable rather than the best amongst us. And I believe there to be sufficient men and women of strength, fortitude, tenacity and courage in this realm to deserve our votes and take their places in Parliament to our credit and to Brown's discredit. The Gordon Browns of this world cannot supress the indomitable will of the English peoples for their freedom and democracy. Many years ago I took over a small construction admin office that was failing badly. Staff had become entrenched in their under-worked niches and weren't covering essential tasks previously done by their colleagues who had left or retired and hadn't been replaced. I did what anyone with two ounces of sense would have done - shared out all the work functions amongst the remaining staff, told them there was no extra money for it but if they did as I asked there was a decent chance they'd all be in work in six months. Most realised the sense of it and knuckled down. One woman, a spinster with genteel pretensions who sort of reckoned she was doing us a favour by working for us, demurred. The carbonless paper documents she was now required to handle, she said, caused her severe allergic reactions. The skin on her hands was irritated she said, and the smell made her eyes water. On these grounds she requested to go back to just doing her previous job, which seemed largely to consist of stamping things with a selection of rubber stamps. A phone call to site and within an hour a driver brought up a pair of welding gloves and a full-face chemical mask. I dropped them on her desk and instructed her to wear them when handling carbonless paper. Within a week her allergy had disappeared. It was all a bit Gene Hunt and I wouldn't try it these days - but I rescued them all, turned things around and within a year had a tight, loyal team doing three times the work that an office almost twice as large had done previously. The point is, the way to deal with this sort of thing is to kill it before it gains any sort of life. Muslims who take cooking jobs in police canteens and then complain they have to cook bacon and sausages. Jews who live in a mixed block of flats who claim the timed hallway light breaches their human rights. Neither of these cases should have come anywhere near an employment tribunal or County Court. Unless we want Christian bank workers to claim constructive dismissal for being engaged in usury against the dictates of their faith, or Jedi Knights to claim faith reasons for turning down a job in MacDonalds, or rastafarians claiming that a requirement for hair nets in a food factory breaches their human rights, clogging the legal system with petty, stupid and vexatious claims, we must find a way to kill all such abuses of our laws. It will mean a reversal of Labour stupidities, of course - but almost everything does, these days. Those architects whose names we know - post-mediaeval, for the most part - have left us with a built legacy that has become part of the national psyche. Vanburgh, Wren, Hawksmoor, James Wyatt, Adam, Charles Barry, Pugin and Lutyens (of whom Jonathan Meades said 'Lutyens is known to have designed eighteen houses, forty-seven of which are in Surrey') and several more are generally recognised by many. Their creations are carefully preserved, and count their life-span in centuries. The names of the eighties - and they are all eighties creations, for neither the nineties or the noughties seem to have produced a single architect of note - still command prestigious commissions and scores of column inches, but their buildings are as temporary as an ASDA depot. Norman Foster, Nicholas Grimshaw, Richard Rogers. Producers of whimsical, amusing, clever and ultimately disposable bits of built environment that will mostly be facing the demolition nibbler within a score of years. The Lloyds building will not be standing in 2050, let alone be loved by then. The Gherkin will be gone by 2080. Like the unloved commercial hulks of the sixties and seventies before them, their future is a pile of crushed rubble. As temporarily appropriate as shoulder pads or Ugg boots, they will linger at the back of the national architectural wardrobe for a year or two before going in the bin. So I am not as concerned as HRH Prince Charles over Rogers' proposals for the Chelsea site. The site will remain a potential development site whatever goes on it - we simply don't have a single architect whose buildings fire the public passion and which inspire popular preservation. Quinlan Terry certainly doesn't. Let Rogers build his portakabin city - it will be dust soon enough, and may even be as temporarily diverting as an amusing poster for a year or two. You're a Prime Minister who is an endogenous liar, and pretty well the entire country realises you're an endogenous liar. Everything you say is distrusted. Your lies are so clumsy and so blatant that even 'Mirror' readers can see though them. If you told an audience that your name was Gordon Brown, four-fifths of them would demand your birth certificate. The truth is more of a stranger to you than perineal hygiene was to Atilla the Hun. You're a few hundred days from being cast out of office, and you, your government, your ministers and your party have the legacy of a costly and probably illegal war during your term to answer for. What to do? Well, given that no inquiry will come up with a result during your government, you could leave it to Cameron to appoint a suitably qualified and distinguished Chair, such as Franks, to conduct a rigourous and far-reaching impartial inquiry. A man who, say, like Franks, had held a chair in philosophy, served as Ambassador to the US, helped found NATO, chaired the predecessor to the OECD, and ran Lloyd's Bank for eight years. A Chair who would get to the bottom of what the British people want to know; who was responsible, and how. A Chair who would not hesitate to recommend criminal indictments against those who had transgressed, and would hear all but the most secret of evidence in public. Above all, an inquiry Chair able to nail clumsy lies from clumsy liars who held the great offices of State during the Iraq war. Or you could, as an act of utter desperation, set up a risible secret inquiry under a civil servant both obscure and undistinguished with a brief not to seek blame but to disseminate 'lessons learned', and hope to Christ that Cameron swallows the con and doesn't feel obliged to set up a real Iraq inquiry on taking office. Must have been a hard call, Gordon. A bonfire of the Directives! This is just a fraction of a single law. Multiply this by ten, and then by the 17,314 EU Acts in force, and you start to get some idea of how far the malign and pernicious centralism of the federasts has penetrated our national identity. I've always viewed book-burning with revulsion, but give me a chance and I'd pile each one of those 17,314 Acts in a huge heap in the middle of Grand Place in Brussels, fire it and dance joyously around the flames. The Speaker has official precedence as the 'first commoner of the nation'. He takes his chair in the name of every elector in Britain; conservatives, socialists, greens, liberals and libertarians, communists and fascists and every shade of belief in between. The need for the Speaker to put aside their personal political opinions and conduct the business of the House with equity and probity, to serve and not to govern, and to remember that the office, and not its holder, is the thing is paramount. Michael Martin never managed it. MPs are all on probation right now. Dirty dogs who must prove they can behave. If they give us a new Speaker out of spite, or partisan plotting, rather than from the highest motives and a desire to demonstrate that they can act responsibly and in the best interests of the people, they will draw the fury of the nation upon their corrupt heads. This election will prove the mettle of the House. Today's exclusive in the NOTW reveals that Balls is ready to play Brutus to Brown's Caesar should Labour still remain stuck at the bottom of the polls in four months. Too late, comrade. Labour's bolt is shot. However, the Tories have been here already, although near two centuries ago. The conflict between the oafish Brown and the whippy youngsters such as Miliband is not a new one. Rayner notes that 'Castlereagh was slow-witted, tenacious and almost inarticulate in speech; he had never swerved from what he considered to be his duty, despite growing unpopularity and ridicule. Canning, on the other hand, had a lively and flexible mind; he was a brilliant orator, with a vein of showy rhetoric and a 'pretty wit' that sometimes made him appear flippant. Canning considered Castlereagh slow, stupid and obstinate: Castlereagh considered Canning as superficial, flashy and untrustworthy'. The old Welsh windbag's loquacious and seemingly interminable 'few words' in support of Gordon last week at the meeting of the Parliamentary Labour Party was the barking of a faithful dog at its master. The Kinnocks know which side their bread is buttered, as the Sunday Times reveals today. Six taxpayer funded pensions between them worth £185k a year, £7.7m in EU expenses, and a minister's salary for her and Lord's troughing for him will see them out nicely, thank you. 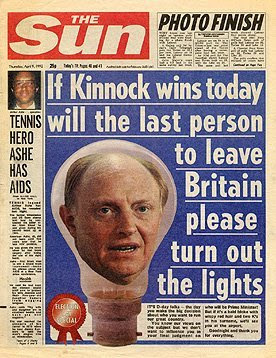 Kinnock mentioned recently that the one thing that really hurt him was the Sun's front page at the election in which he led the Labour Party to abject defeat. So here it is, Neil. Enjoy.